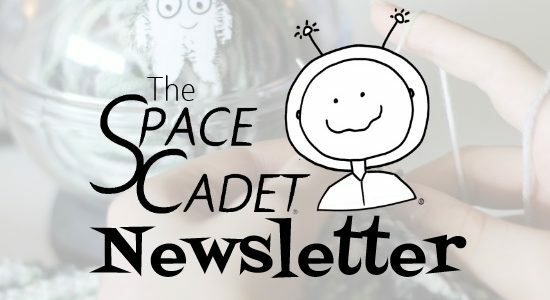 SpaceCadet Newsletter: A Little Good Luck! There’s some sort of weather watch alarm on my phone that goes off with such a shriek that it always makes me nearly jump out of my skin but, when it went off this time, it didn’t surprise me at all. The clouds were moving fast, rolling over themselves as they went, and the sky was rumbling with thunder and crackling jagged flashes. I went out to the the porch and sat down to wait for the rain to come. this is actually how the sunset looked — no filter! And as I waited and watched (and knitted of course), and though the rumbling and flashing continued and I fully believed we were about to get pelted with rain, to my surprise, the storm seemed to slowly begin to turn. Little by little, all the thunder and lightening headed north and while we got the spectacular light show of a big summer storm, there was only the slightest sprinkling of rain. 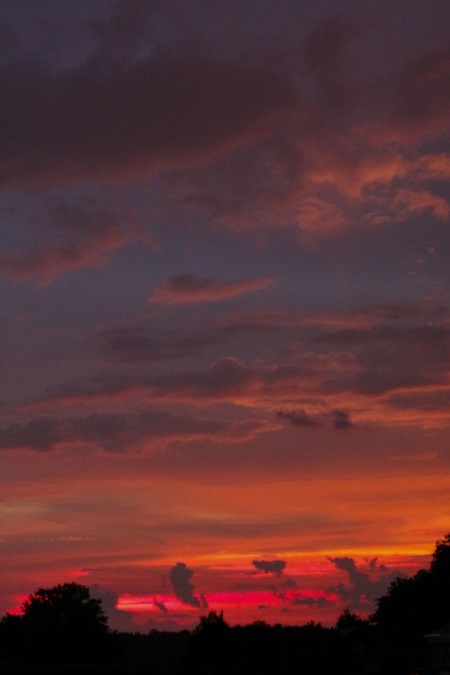 And then, once the weather had moved on, it left us an incredible sunset (so gorgeous, I actually gasped), like a kind of celebration. I was thrilled at this little big of good luck: in all the time I’ve lived in this house, I’ve never seen a storm turn like that. But, with all the hassle that storms have caused us this year, I’ll take it! I am deeply intrigued by this new knitting and crochet app, called Placemarker, designed to completely change how we interact with our patterns on mobile devices. They’re about halfway to their Kickstarter goal and have less than a month to raise the rest — click here to check it out! The architecture of sleeve caps and armholes always blows my mind (to be honest, I find the turn of a sock heel wildly exciting too… maybe I don’t get out enough?). Anyway, I absolutely love Carol Feller’s video walk-through of creating sleeves using short row sleeve caps. It’s kind of like magic. If you’re going on a one-week summer trip, how many projects do you bring with you? Three? Five? More?!? Choosing travel projects is notoriously tricky, so I was glad to see Kim Werker’s musings on Packing for a Crafty Road Trip. Then I saw her list of tools and materials… ‘Nuff said. Jane Austin’s Pride & Prejudice is a firm family favourite in my house (the book first, then the 1995 BBC version, and never ever the Kiera Knightly abomination, thank you very much), so I squealed with delight when I found these absolutely fantastic P&P page flags in a local shop (cough… it may have inspired an all-night knitting binge with the aforementioned BBC version that very evening). In the same set there’s also page flags for Emma, Anne of Green Gables (squeal! ), Little Women, Wuthering Heights, Les Miserables, and the list goes on. If you’re a bullet journaller or notebook lover as I am, it’s worth checking out all of their page flags — they’re so pretty! 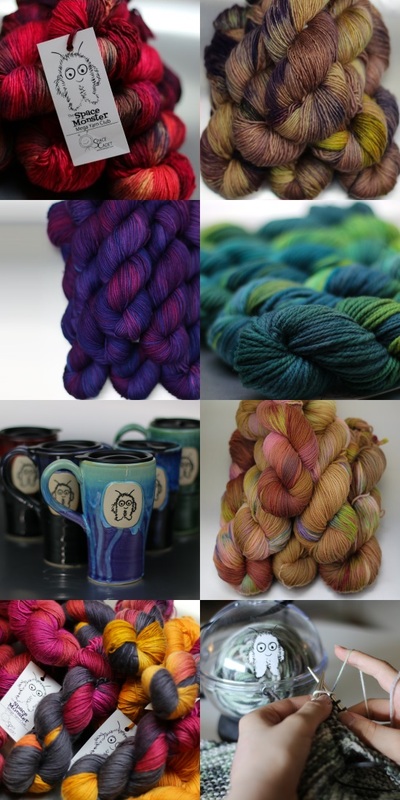 I’m so excited about the upcoming season of the SpaceMonster Mega Yarn Club, because we’ve had so many new and renewing members join and I know it’s going to be a ton of fun! But subscriptions close on Sunday so, if you’ve been thinking of getting in on the fun, now is the time! Want to join us on this colour adventure? The SpaceMonster Club is our worsted and bulky weight club, because big squishy yarns are smooshy and soft and so much fun to work with (they’re so quick!). I mean, they’re what got me started knitting in the first place (you too?). If you feel the same way I do, and you love colour like I do, click here to join us in all this lovely squishy yarny fun! It has been exceedingly hot lately, so hot that I’ve almost not felt like knitting or crocheting (I know, I know, but when its in the 90s and with 200% humidity, it’s really pushing it). When times are like that, there’s nothing better than designers from even hotter climates to find patterns to inspire. Laci Cardi by Rebecca Velasquez is a gorgeous example: based in Texas, Rebecca knows hot and, with its gorgeous lace openwork (just look at how the sunlight passes right through it! 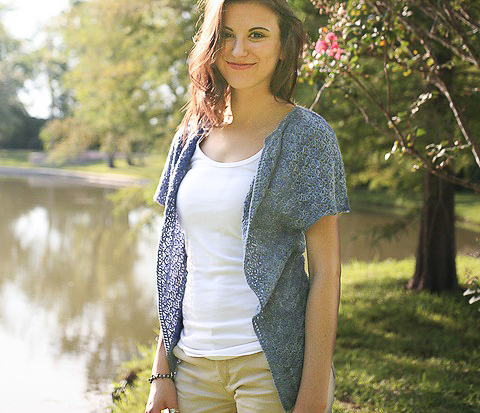 ), this cardi is the perfect summer cover up. Try it in SpaceCadet Pyxis for a light hand with bold colour. 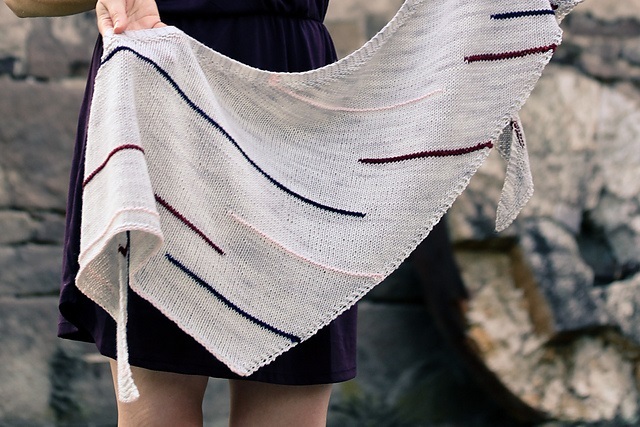 Sometimes simple is absolutely amazing, and this shawl from Jennifer Dassau is case in point. She’s knit her sample in neutrals but here’s what I’d do: work the main body in Ombre Mini-Skeins, changing colours halfway between the contrast accent lines, and then knit those accent lines in either a boldly contrasting skein or in the same Ombre worked in the opposite direction. Wouldn’t that be amazing? Barbara Benson does this amazing thing, Mosaic Lace, that sounds like it totally shouldn’t work but which really really does. And if you love colourwork but find it too heavy for summer days, her designs are exactly what you need. 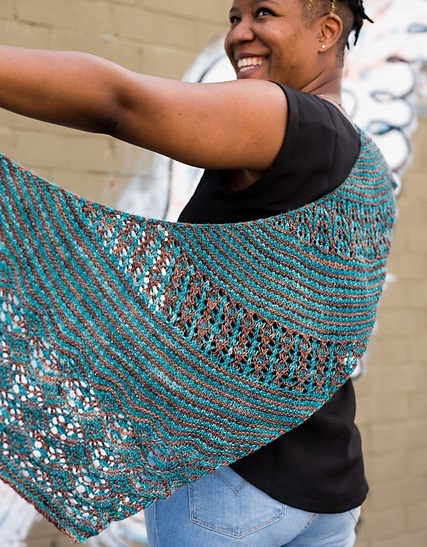 Take this gorgeous shawl for example, with its fun contrasting colour play and beautiful open stitchwork that lets the sun (and the breeze!) flow right through the work. Designed in DK, I think I’d be included to play with my gauge and go a little lighter this time of year, and knit it in Celeste, perhaps in Troublemaker and Headstrong, Tickled and How Dare You!, or Fizz and Look Up! Ok, I’ve got to get down to the studio (before the heat of the day kicks in?) because we dreamt up an awesome new dye recipe this week and I can’t wait to try it. I hope you have a wonderful (and air-conditioned!) day ahead of you too and, until next time, all my best! SpaceCadet Newsletter: Things Have Gotten Kinda… Funky.